Riding season is over for most of us here in the states; however, that does not mean we need to stop wrenching. Winter is the perfect time to start going through your bike and repairing all the things that were put off during the summer. Here at the Common Motor Collective, we have started ”Project Diamond,” a 1973 Honda CB450K that has seen some better days. 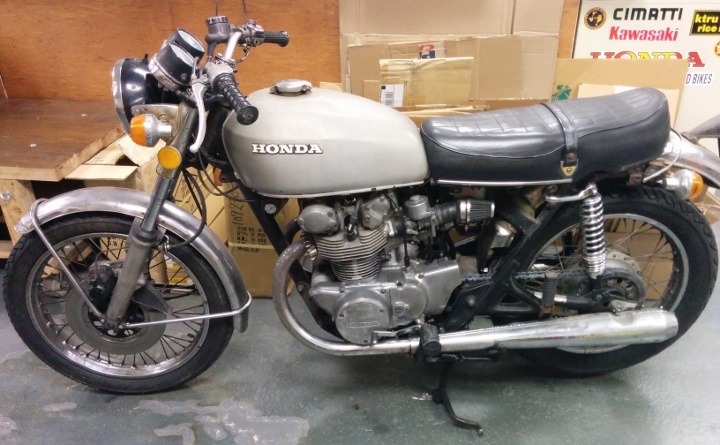 Common Motor Collective member Yanni purchased the Honda CB450 a few months back in semi-running condition. Since then, he has ridden it a couple hundred miles only to discover the bike needs some engine work to deal with a serious oil leak. Considering that the engine has over 37,000 miles on the clock, it is time for an overhaul. But why stop there? We decided that this old Honda CB450 needed a complete rebuild from top to bottom. Over the winter through mid spring we are going to go through the entire bike from engine, suspension, brakes, electrical, to fuel system and aesthetics. We will be documenting the entire build, showing the parts, tools, techniques and processes needed to take a bike like Diamond from a crusty barn find to a stripped down solid daily rider. 1) Mechanically Reliable: We want this motorcycle to be a one-kick starting, non-oil dripping, no-electrical-short, machine able to ride cross country. 2) Safe to Ride: Tires, brakes, suspension, lights, riding control... need we say more? 3) Increased Performance: The finished motorcycle performance needs to be as least as good as it was when it left the factory, if not better. 4) Aesthetically Awesome: We all like bikes that look cool, however we would never trade any aspect of our first three goals in exchange for aesthetics. Too often we see bikes built that compromise safety, reliability and performance in the pursuit of looks. The final aesthetics need to complement the first three goals so we can have beautiful daily rider (no trailer queens here). Yanni wanted to name the bike after a lady he met in New Orleans. But more metaphorically speaking this old gray Honda CB450 is kind of like an old stripper. She is over 40, been ridden hard, and is looking pretty rough. We felt that it was only appropriate to give the old gal a chance to sparkle on stage once again. Next Time: Pulling out (the engine). Swiiiick! Can't wait to see the rest. Hey Brendon & Yanni, Very ambitious project. Yeah for sure keep me updated as the build progresses. You guys will give me the inspiration to continue with my '75 CB360T. This going to great to watch! Thanks and keep up the good work. Looking forward to following this build. Looks cool the way it sits, I am sure it will be shauweeeet when it is done! Nick Names are good. My 1975 CB360T Is nicked named "Take It To The Limit" (Eagles song). I will be watching. Merrill, Washburn, Iowa. Awesome! Can't wait! Exactly what I need while going through my own build; 1975 CB360T. Thanks guys!! Great! This is perfect for me. I rode a '67 Black Bomber in 1968-69 (never had any problems, never did any maintenance that I can recall, but really missed a 5th gear and turn signals) So now over 45 years on I just recently bot an early '69 K1 with high mileage and lots of rust and broken parts, and a very low mileage 1972 K5, and am in process of buying a 1976 500T. Very pleased with the prices and availability of parts at Common-Motor.com and the great free advice. Does any one know if a 1974 cb450 has two holes or one hole in the brake cyclinder reserve? I have a sticky front brake caliper and know a plugged hole can be a problem I looked in the reserve and see two drilled holes but only one goes all the way thru to the master? I am rebuilding a 1974 cb450 master brake cylinder there are two holes in the brake fluid reservoir but only one seems to have a complete hole all the way through to the cylinder are both holes suppose to go all the way thru? Great video series, you guys are doing a great job. How many to date, is there a date stamp to watch in sequence. I have worked on CB100, CL175, CL200, CB/CL350, CB/CL360. I have two CB450s but I have not started on them yet. The double over head cam and the torsion bar valve springs have held me back. It is amazing the similarities between bikes. The clutch on the CL175 is the same as on the CB450.